Read on for our list of fun things to do in St Petersburg, Florida! From watching dolphins to walking a mile long boardwalk in a nature reserve, St Petersburg offers the nature lover a host of fabulous activities. For sports lovers, you can kayak, snorkel, swim and jet ski on the blue waters of the Bay. Historians will find many fascinating Museums and art galleries to explore and kids will have a blast at a splash pool and slide. Watch greyhound dogs racing, try your hand at poker and learn how to ride a Segway. This fabulous city is calling! Relax and soak up the ambiance on a luxury cruise, the first fabulous thing to do in St. Petersburg. Join a cruise that sails along the beautiful Boca Ciega Bay in St Pete Beach. 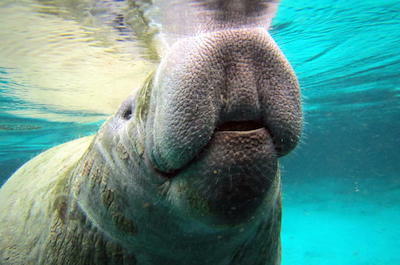 You will be treated to seeing dolphins and manatees close up in their natural habitat. If you are happy to get wet, jump in and snorkel with these amazing creatures, you will make memories to last a lifetime. If you prefer to remain on deck, watch out for other marine friends like sea tortoises, rays and sea birds. You may also spot a friendly shark or two! For something more relaxed, cruise the blue Bay waters in a luxurious yacht. Choose to relax indoors or outdoors. Listen to music, enjoy a slow dance with your partner, admire the views and enjoy a fabulous 3 course lunch on deck. For the ultimate romantic adventure, the Sunset Cruise with Beer sails leisurely into the golden Gulf of Mexico as evening falls, while you sip a complimentary beer or soft drink. 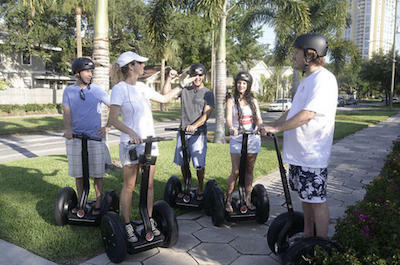 Discovering the historic sites of the city on a Segway is an amazing thing to do in St. Petersburg. This unique method of travelling is ideal for all ages and levels of fitness. After a quick lesson and safety briefing with your guide, step onto the platform of the two-wheeler and off you go! The one-hour tour starts with a cruise along Bay Shore Drive along the Bay, passing the beautiful stately Victorian homes to the bustling downtown area. Your guide will tell you all about the history and culture of the Tocobaga Indians, whose princess was the inspiration for DisneyÕs Pocahontas. Visit St Petersburg-Tampa Airboat Line, this is where the worldÕs first commercial flight took off from. Stop and admire pictures of the pilot, Tony Jannus and the aircraft. Then you are zooming off to St Petersburg Pier, a fabulous tourist spot where you can see the famous brown pelicans diving into the water for food. This once-endangered species now mixes happily with tourists and locals. Your trip ends back at North Straub Park. 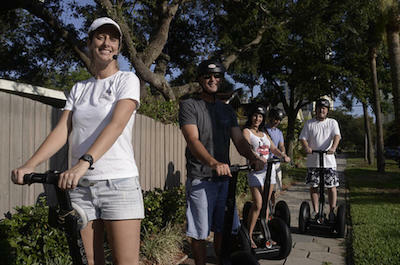 After exploring the historic sites on a Segway, you are now an expert and ready for the next exciting thing to do in St. Petersburg - a Segway nature Tour! This small group personal guided tour is ideal for the family or group of friends. 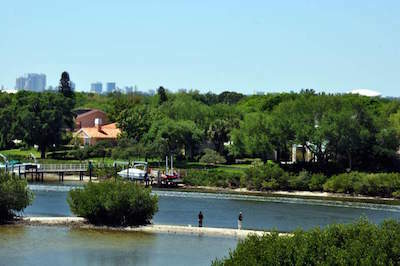 Meet your knowledgeable guide and set off along the Tampa Bay seawall, through the Gizella Kopsick Palm Arboretum. Nature lovers will be thrilled to see more than 500 palms and cycads representing over 150 species from around the globe. Stop along the Bay to learn about the manatees and watch them play and feed in their natural habitat. Next it is off to the Sunken Gardens, a paradise in the middle of the city. This exotic botanical garden is the oldest living museum in the city. See flamingos, colorful butterflies and koi-filled ponds. Snap photos of the cascading waterfalls and stroll around the pools filled with subtropical plants. There are over 500 species of plants in the garden and 50000 plants in all Ð a nature lovers dream! When you feel the need for speed, we recommend the next amazing thing to do in St. Petersburg Ð the Speedboat Tour. Get a rush of adrenaline as you drive a speedboat across the sparkling blue waters of Tampa Bay. 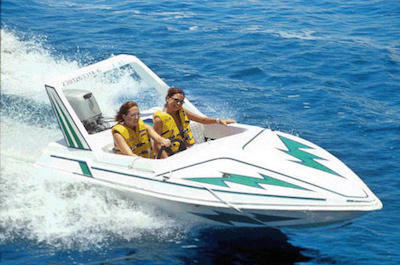 The tour takes 2 hours and you will follow a guide in your own 2 seater F-13 mini speedboat boat, with a full two-way communication system so you can talk back and forth. As you zoom along your guide will point out historic sites like the National Wildlife Refuges, the Fort De Soto Park, Egmont Key and the Sunshine Skyway Bridge. 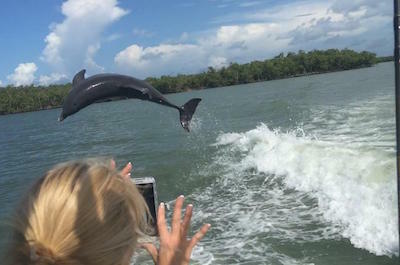 The Florida coast is full of dolphins, manatees, gopher tortoises, sea birds and other marine life and you are sure to see some up close swimming next to your boat. The tour makes several stops along the way for you to catch your breath and admire the stunning scenery while learning about the history and culture of the region. The stops also allows you to switch drivers, so you can both have a turn at showing off your speedboat skills! The waters around Shell Key and Egmont Key offer an enchanting array of colorful marine life and taking a snorkeling tour is a definite thing to do in St. Petersburg. Join a 2-hour combination dolphin watching and snorkeling cruise along the beautiful Boca Ciega Bay in St. Pete Beach. Spend time learning about these adorable creatures and see them up close and personal in their natural habitat near the sandbars where adults and calves love to play. Then it is off to Gulf of Mexico where you can put on your snorkeling gear and explore the magnificent underwater sights. The water is crystal clear and only three foot deep, so this is suitable for all ages. Find live shells and conches and swim with the dolphins. If you want exclusivity, join the Private Snorkeling Trip. You will visit Egmont Key and Shell Key islands. Have a private snorkeling lesson with your guide and then explore the amazing underwater scenery, you will also be treated to fabulous underwater scenes of the ancient sunken ruins of Fort Dade! The Gulf Coast is home to a myriad of exotic wildlife and the Boyd Hill Nature Preserve offers nature lovers the opportunity to explore the unique ecosystems in which the plants and animals live. The 245 acre park offers hardwood hammocks, pine flatwoods, swamp woodlands, a marsh and a lake shore. There are 6 miles of walking trails and boardwalks along the shore of Lake Maggiore. Set off and spot alligators, lizards, rare birds, beautiful butterflies and more. Explore on your own Ð you can walk or if you donÕt feel fit enough, tram tours make a relaxing way to get around the Preserve. You can also join a bike tour with a knowledgeable guide. This small group tour takes 2 hours and is ideal for a family group. For children, the Park has a playground and an aviary where they can see birds of prey. Enjoy a lunch in the picnic areas and if you want to stay longer, there is an overnight camping site. Do not miss this fabulous thing to do in St. Petersburg. Art lovers will be in for a treat with our next fabulous thing to do in St. Petersburg. 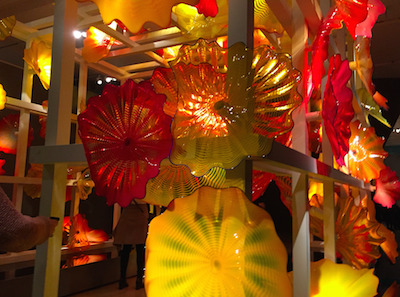 The Chihuly Collection is a world famous exhibition of glass work with a difference. Located in the Morean Arts Center on Beach Drive, you will awed by these massive creations. Stroll around see the vibrant and complex works. Learn about how they are made and watch a live glass blowing demonstration in the Glass Studio. You can even have a lesson and make your own art piece! Then buy a souvenir at the Gift Shop to take home. Learn how the Center runs an innovative arts program for the community. The artist, Dale Chihuly is a pioneer of the studio glass movement. He extends his work into complex, multi-part glass sculptures and environmental art and some of his iconic displays are located in Venice and Washington. If you purchase a Tampa Bay City Pass you will have access to the Museum and the glass blowing demo is included in the Pass. Just when you think you have seen it all, there is another great thing to do in St. Petersburg. Head to the Coffee Pot Bayou in the Historic Old Northeast. Here you will find a host of attractions for the whole family. Start with the North Shore Aquatic Complex which will delight the kids with a splash pool and water slide. 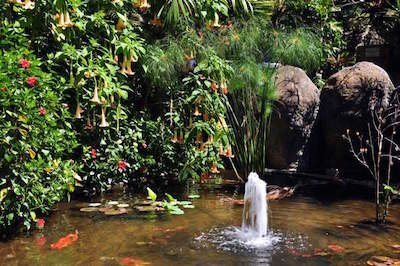 Then visit the Gizella Kopsick Palm Arboretum. This beautiful Park features more than 500 exotic palms and cycads from around the world. Join a tour to learn all about these fascinating plants. In the waters near the Coffee Pot Bayou you can see manatees, turtles, egrets, herons and the dolphins. Stroll along the walkway and admire the stunning views. If you want to try your hand at fishing, this is the perfect place. Have a swim at the small beach and relax on a lounger. Then visit Snell Isle Bridge, an iconic landmark in St Petersburg. Watch the artists at work painting this fabulous bridge and buy a unique art piece as reminder of this special place! How about visiting a tiny island that can only be reached by boat? Sailing out to Egmont Key is a fun thing to do in St. Petersburg. The 450 acre island has a fascinating history Ð it was used as a jail for Seminoles and its strategic location in the Bay made it famous during the Civil War. A fort was built here to guard against attacks from the sea. Trips to Egmont Key leave from Fort DeSoto Beach. You can go alone or join a tour that takes you on a cruise boat or a speedy jet ski! 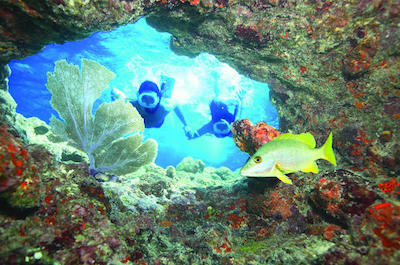 When you arrive, you can snorkel in the crystal clear waters and discover a myriad of marine life under the water. Enjoy the hiking trails that weave through the islandÕs interior and look out for the famous gopher tortoises that call this paradise home. Have a swim and relax on the pristine beach. 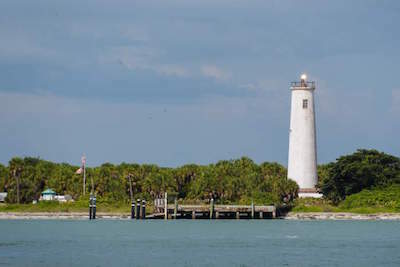 Then take a walk to the end of the island and snap some photos of the Egmont Key Lighthouse, built in 1858 to guide ships across the Bay. In the mood for a quite break from the City? 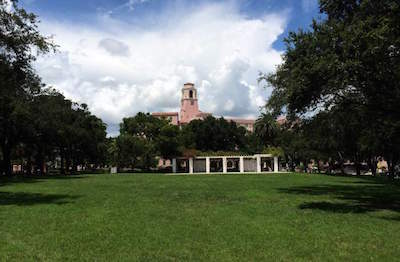 A visit to North Straub Park is the perfect thing to do in St. Petersburg. It is easily found, located on the waterfront of downtown St. Petersburg. This small and tranquil Park is just under 5 acres in size and offers walking trails, scenic picnic spots and a stage for community events. Sit and relax and soak up the restful ambiance. Then take a stroll to the southern end and visit the Museum of Fine Arts. It was founded in 1965 by Margaret Acheson Stuart. The venue reflects her dream of showcasing memorable examples of art from around the globe in a beautiful setting. 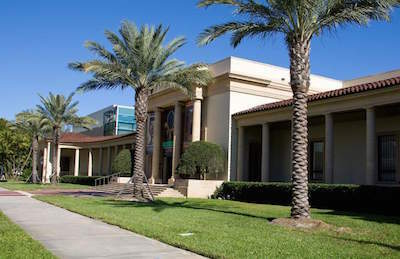 Historians will love the St. Petersburg Museum of History, showcasing exhibitions of the history of the area. Then get onto the water and rent a beach cruiser at Wheel Fun Rentals. If you are visiting at Christmas, New Year or the Fourth of July, the park is magnificent, lit up with lights, decorations and a fabulous firework displays. After exploring the city on a fun Segway, relaxing on the beach will be a welcome thing to do in St. Petersburg. 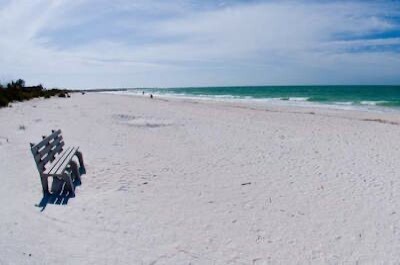 Head for St Pete Beach, an award winning tourist destination. It is located on Corey Avenue and the district offers a wide range of entertainment as well as stunning sea and sand. Here you can find the architecturally and historically grand Don CeSar resort where you can stay over or visit for lunch. See the museum and visit the Pier where you can shop and grab a bite to eat. Then rent your umbrella and lounger and get set to relax and soak up the sun. The balmy waters of the Gulf are warm due to its average of 361 days of sunshine in a year. The sand is perfectly white and clean and all amenities you need are close by. If you want to get active, do some snorkeling or rent a paddleboard or a jet ski. As evening approaches, be prepared for a magnificent sun set over the water! 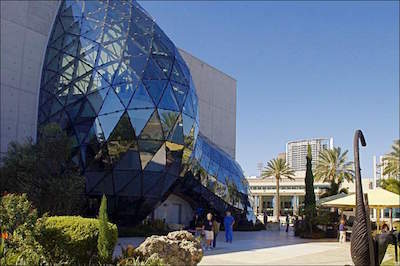 Art lovers will be delighted to know that a visit to the iconic Salvador Dali Museum is the next thing to do in St. Petersburg. This awe-inspiring venue houses a permanent collection of oil paintings, drawings, fine prints and surreal objects created by Salvador Dali. Stroll around the 20000 square foot hall and soak up the ambiance. The Museum also offers interesting lectures to expand your knowledge of Dali. The Museum was created by the Morses family after having purchased one painting, the ÔDaddy Longlegs of the Evening, Hope!Õ. This was the first of many acquisitions, which would end forty years later in the permanent collection of DaliÕs work in America. Today there are over 2000 works created during his life. The building itself is a work of art, located on the on the waterfront of Tampa Bay. Stroll around the Avant-garden, a unique environment of learning and tranquillity. Then explore the Mathematical Garden which allows students to experience the relationship between math and nature. The beautiful labyrinth in the corner invites you to walk it and experience total well-being. If you are looking for culture and art, there are so many things to do in St Petersburg to ensure a memorable experience. Spend time in the fabulous St Petersburg Museum of Fine Arts to get your fill! The Museum was founded by Margaret Acheson Stuart and was opened in 1965. Her dream was to showcase fabulous examples of art from around the world in a truly beautiful venue. It offers permanent and changing exhibits for a diverse audiences. Stroll around and view the amazing artworks that range from painting to photography, sculptures and glasswork. Take part in fun family activities. Try Kidding Around Yoga, Make & Take activities, Drumming and Art and Sign Language. The Explore More Gallery is designed for younger kids to explore their creative side. Adults can join in the Porch Parties on Thursday nights, where you can relax on the porch, sip a drink, enjoy delicious food and meet other art lovers! If youÕre up for a nature encounter like no other in the world, visiting the Sunken garden is the thing to do in St. Petersburg! This botanical paradise is located in the middle of the city and is St Petersburg's oldest living museum. Established over 100 years ago, it is home to some of the oldest tropical plants in the region. Relax and rejuvenate your mind as you stroll along the beautiful winding paths, through lush greenery and exotic colorful flowers. On the way you will be enchanted by cascading waterfalls and crystal clear pools. See the demonstration gardens that exhibit over 50000 tropical plants. If you want to learn more, join a tour with an expert guide who will answer all your questions. You can also get hands-on learning how to cut and plant, make fabulous flower displays or even learn how to take better photos of the magnificent flowers. There is something for everyone in this tiny piece of paradise! Photo by Walter on Flickr. Just when you think there canÕt be more things to do in St Petersburg, youÕre in for an unbelievably rare experience! Spend a day at the amazing Sawgrass Lake Park and learn all about maple forest swamps on the Gulf of Mexico. 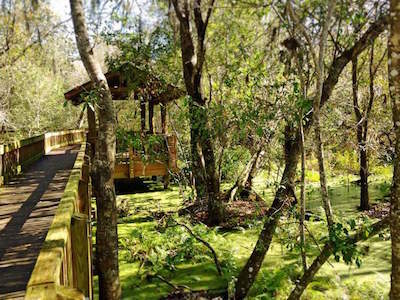 This 400 acre park offers a wooden boardwalk that is a mile long! You can stroll along and observe the scenery and natural landscape. It is an easy walk, ideal for all ages and levels of fitness. It you want to explore further, take the half-mile dirt trail and look out for rare birds, butterflies, plants and animals in their natural settings. There are herons, ibis, wood storks, egrets, alligators and turtles that can be spotted along the canals and lakes. The park attracts 1000Õs of migrating birds during the fall and spring making this a bird-watchers paradise. Before leaving, visit the Education Center and then go to the top of the Observation Tower for a birdÕs eye view over the Park! 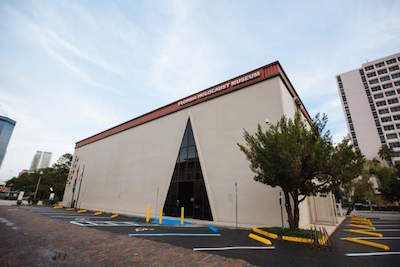 Visiting the Florida Holocaust Museum may be a sobering thing to do in St. Petersburg, but it cannot be missed. It is situated at 55 Fifth Street South and is one of the largest Holocaust museums in the United States. It was founded in 1992 by Walter and Edith Lobenberg. These two amazing people were German Jews who managed to escape Nazi Germany by immigrating to the USA. See the ÔHistory, Heritage, and HopeÕ exhibit which offers a self-guided audio tour through the history of the Holocaust. It starts with the history of anti-Semitism and life before World War II and then continues with the rise of Hitler, the Nazis and has information on anti-Jewish legislation. The exhibition ends with displays of concentration camps and killing centers and also has a real boxcar that was used to transport Jews to the camps. Listen to a lecture on human rights and then set off to mull over what you have seen at a nearby coffee shop. 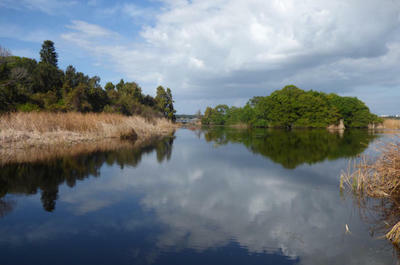 After your visit to the Holocaust Museum, lighten up and get outdoors Ð visiting the Weedon Island Preserve is the next fun thing to in St Petersburg. It is named after Leslie Washington Weedon, a Tampa doctor and archaeologist. This 3190 acre natural area located on Tampa Bay offers a variety of natural ecosystems such as mangrove forests, pine flatwoods and maritime hammock. The area is home to plethora of animal, bird and marine life. It is rich in cultural history and in 1972 it was added to the US National Register of Historic Places. Indigenous people occupied this area and shell mounds identify where they lived. Take a guided tour and learn all about this diverse natural region. Bird lovers will be enchanted by the variety of species and if you want to try your hand at fishing, you are sure to catch one for dinner. Take a kayak ride through the swamps and walk along the nature trails, A perfect day outing for the whole family! After horse riding, kayaking and walking, you need to settle down and relax with a great glass of local wine Ð the next must-do thing to do in St. Petersburg! 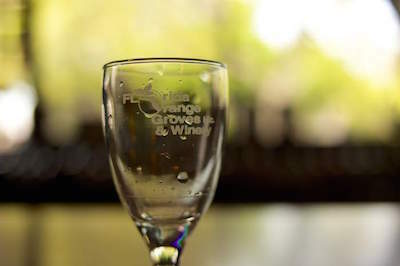 Stop in at the Florida Orange Groves Winery for a tour and a tasting. This tropical fruit winery is a 3rd generation family owned business. The Shook family started out by packing and shipping fresh citrus fruits in the 1970's. The business grew as they experimented with fruit wines and is now a fully operational working winery. Book a tour and sample some of the over 40 different varieties of world class tropical fruit wines. You will be pleased to know that are also gluten free! Try the Hurricane White Sangria, the Key Lime and the fabulous Mango Mamma, they all hold a host of awards. It takes almost 9 pounds of fruit to make one bottle! Relax in the beautiful setting and learn all about the success story of this iconic venue. If horse racing gets your adrenaline pumping, you will love our next recommended thing to do in St. Petersburg. Derby Lane is a world famous venue where greyhound dogs race Ð something totally different. This is the oldest greyhound racetrack in the country and in 2006 and 2007, Derby Lane was the site of the Derby Lane Million, the richest greyhound race in history. The winner took home $500,000! Set off and try your luck with some small, or large, bets or just get settled down in the stands and enjoy the ambiance. Racing is held throughout the year and a full program is available. After watching these beautiful dogs speeding around the track, you can relax in the Poker Room and try your hand at a game or two. Then head for the restaurant and order the shrimps and crab legs, washed down by a local wine. Before heading home, you need to do one more fabulous thing to do in St. Petersburg! Visit the St. Petersburg Museum of History and up your knowledge of the history and culture of the region. The Museum is located at 335 2nd Ave NE and is easy to access. See the large range of permanent exhibitions that will teach you about the Seminole People of Florida and Florida Folk Art. Kids will be delighted to the see the Lady of the Nile, a 3000 year old mummy! Step outside and see the mural on the north wall, a community project that involves young local people. Then see the Sunshine City gallery which showcases the history of the city from pioneers to trains. For all things aircraft, visit the Flight One gallery. There is something for everyone and a perfect way to spend the day and end your St Petersburg trip. Calling all horse lovers! If you are looking for equestrian aquatic adventure that you will never forget, you need to take part in our next fabulous thing to do in St. Petersburg. Join a beach horse ride with C Ponies Beach Horses. You can choose from two locations, Bradenton or St Petersburg. The ride is suitable for the whole family and no previous experience is needed. You will be given a saddle and a brief lesson and you are off. The ride takes you along the beach where you admire the stunning scenery. Stop and enjoy a walk and collect some seashells to take home. Then get back onto your steed and hold on while you enter the water and have an invigorating swim on horseback. The horses actually swim while you ride! The venue is owned by Carmen Herrmann Hanson. Her family was one of the first to import, breed, train and show the iconic Lipizzan Stallions in the USA, giving her all the expert knowledge she needs to make your day totally awesome.